Remember when you were a kid in school, and around Halloween, Christmas, or Easter, a huge jar of candy corn/jelly beans/gumballs would appear on the teacher’s desk? Remember when you'd get to guess how many jelly beans were in the jar and write it down on a little scrap of paper with your name on it, and turn it in to the teacher? And whoever guessed the actual number of items in the jar most accurately won the entire jar of candy?! I desperately wanted that jar. In my 13 years of school from kindergarten to senior year, in which I had at least 30 tries at guessing the number of various candies in various jars, I never once, ever, won. This is because I have horrible estimation skills. Ask me to guess how many people fit into that college football stadium over there, and I would say, "1500!" Ask me to judge how cold the water in Lake Michigan is right now, in June, and I would say, "25 degrees Fahrenheit!" Or how many more miles we have left in a cross country road trip to reach our destination and I'll blurt out "2,000!" without looking at a map. Poor me, I never stood a chance at those jars of candy games. I accept that for the rest of my life, I will have to buy my own giant bags of candy corn and big glass jars in which to put them. 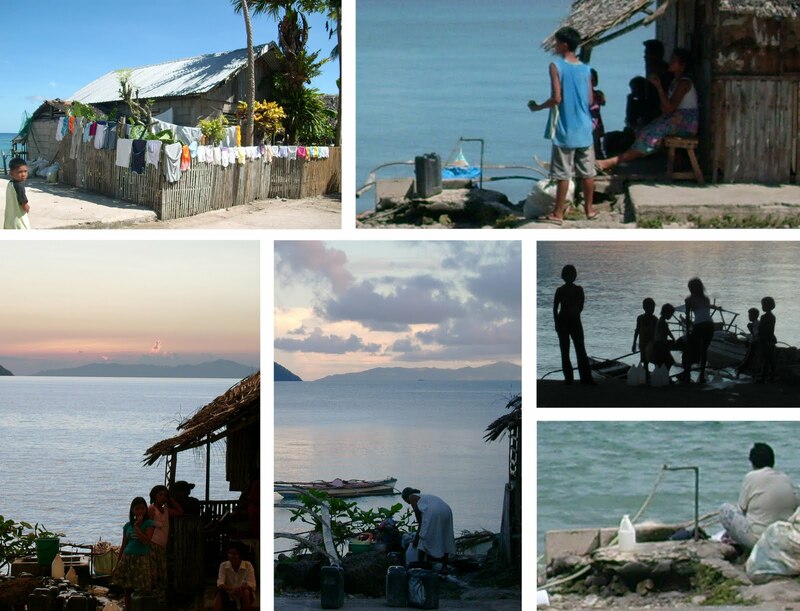 But now, thinking back on one particular day in our Southeast Asia travels, my hope is renewed! I can think of one of these types of games at which I would actually win. I need to find a contest that asks: How many stairs can you climb in the midday sun, in 100F degrees heat, in the middle of the dry season in India, without eating breakfast or lunch and without water. 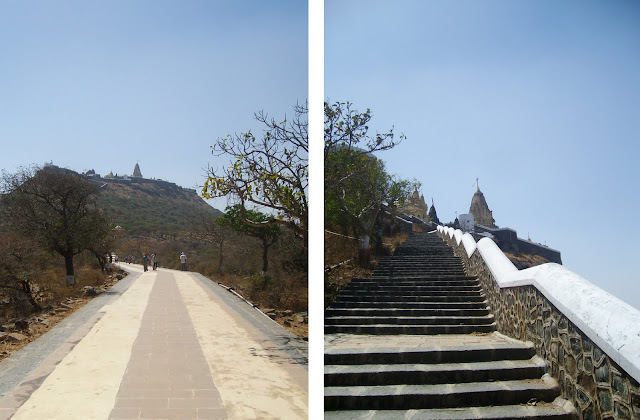 These steps would be climbed all at once, without stopping. Guess the exact number and you win a lifetime supply of jelly beans!! (whooo hooo, and the crowd goes wild!). Please tell me this contest exists somewhere, otherwise, that one day of our trip where I found out this piece of information will be a cautionary tale that I get to tell when people ask, “so does traveling day in and day out with your husband affect your relationship?”. Let’s just say the easy answer to the question is: if you can make it through India without one purposefully pushing the other into a fresh pile of cow dung (on accident is a different story), not stalking off into opposite directions in a fit of frustration, or still laugh when you realize that the contact lens you both spent a bumpy and dark 20 minutes searching for on the dirty bus floor turned out to have fallen directly and neatly into your purse...you'll probably make it through anything. Sergio, being so good with maps, routes, and distance estimations, did the majority of the technical planning of our trip. I’m a little more “loose” in my planning style. Had I been in charge of that aspect of the trip, we would have arrived to Delhi, eaten breakfast, wandered around aimlessly a bit and then said “ok, now what?” I believe that style of travel is great in a place like, The French Riviera, or Venice, but do that kind of thing in India, and you might end up washed away in a sea of people and cows. Thankfully, Sergio more than makes up for what I lack in this department, and he meticulously planned out an awesome six months where we saw SO many things. Our traveling schedule was such that sometimes we would plan to see one thing in one place in the morning, and get to another place quickly in the afternoon. On one hand, it meant that we were able to see a huge amount of things in our short time in each place, but on the other hand, it meant that sometimes we stretched ourselves out a bit too far. Sometimes, it meant that I wanted to sink down wherever we were and start crying for a warm bed and a TV. And others, it meant that I had the uncharacteristically violent urge to push Sergio in the path of the train that he was running in front of me to catch. 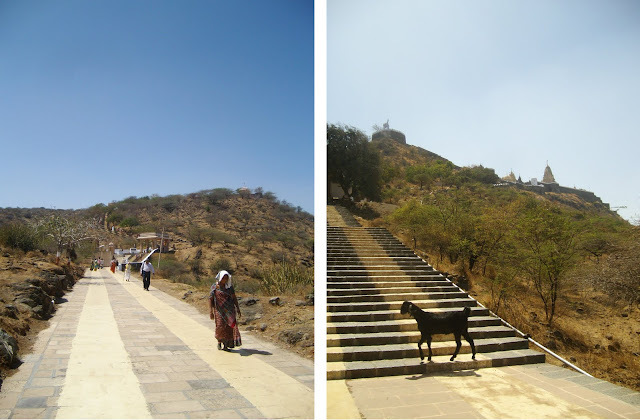 One of these times was in Palitana, India where I learned exactly how many steps I can climb up in the hot sun, on an empty, slightly sick stomach, without breakfast or water. Ah, just mentioning the name now makes me instinctively reach for a glass of water. The golden answer? 2,843 steps up. (which, as those of you familiar with the laws of physics will know, also means 2,843 steps down). The plan was simple. 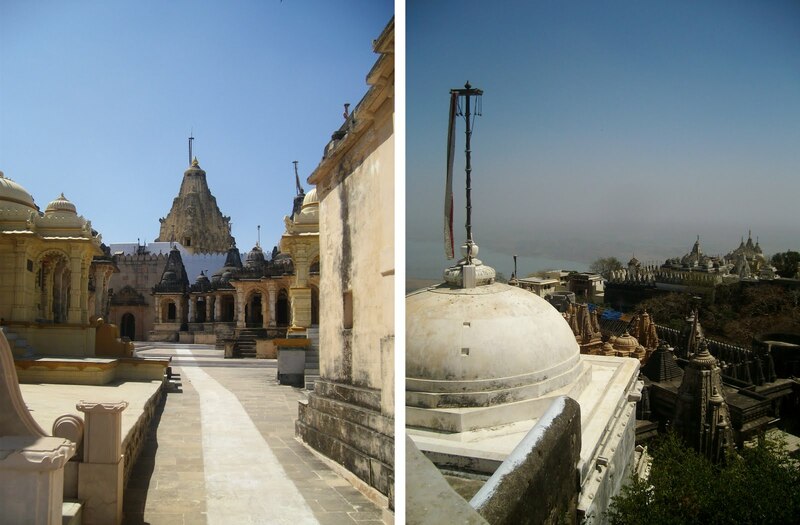 On our way from Diu to catch our 5pm flight at an airport that was 230km away in Bhavnagar, we would stop for the morning in an ancient and religious place called Shatrunjaya Hills in Palitana. 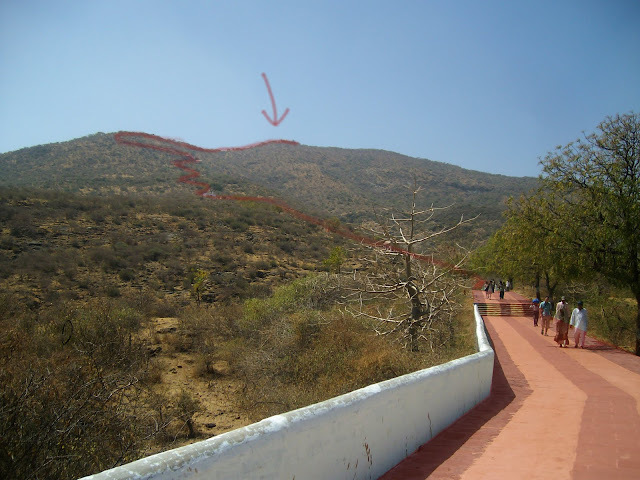 These hills are the most sacred pilgrimage site for the Jainism religion. 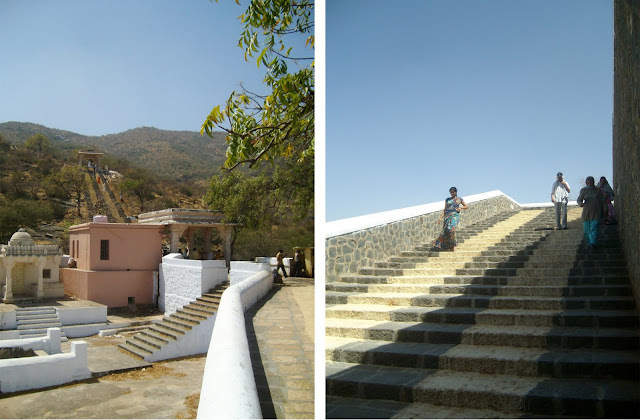 The act of ascending a steep path to reach a place of pilgrimage is a part of the Jain consciousness, so every Jain wants to complete this pilgrimage at least one time in order to be fit to get into heaven. The area in Palitana is filled with over a thousand temples but the main attraction is a cluster of 863 exquisitely carved marble temples which have been built over the course of the last 900 years at the summit of Shatrunjaya. The path up extends for 3.5km over 3,200 stone cut steps that climb over 600 meters of height, offering amazing views of the valley and the Shetrunji river. Our taxi dropped us off around midday, and we approached the main temple area. We took one last look at the Lonely Planet, and Sergio noticed something. Being used to these kinds of rules by then, we took one last long drink, dumped out our water, stepped through the gates, and began to head up the hill. At step 500, I was enjoying myself. There were hundreds of pilgrims surrounding us, mostly dressed in flowing white robes. It was a very spiritual experience - climbing towards sacred temples in the sky amongst pilgrims. They were quietly praying, or just concentrating on putting one foot in front of the other. At the bottom of the steps, there were groups of skinny but muscular men standing around, offering rides up to the main temple in a dholi, a little swing chair suspended by a long stick and ropes. Two men held on to opposite ends of the stick and carried people up and down all day long- mostly those who were too old or sick to walk, but a few obviously rich Indians took advantage too. I looked down my nose at the rich ones who just seemed lazy, wondering if being carried up to the temple when one can perfectly walk completely negates the whole pilgrimage/sacrifice aspect. These groups kept offering me rides, and I kept shooing them away, slightly offended that they thought I couldn’t/wouldn’t make it all the up. Around step 1,000, I began to see why they thought I would need a ride up, as my enthusiasm drained away quickly. I slowed down considerably. 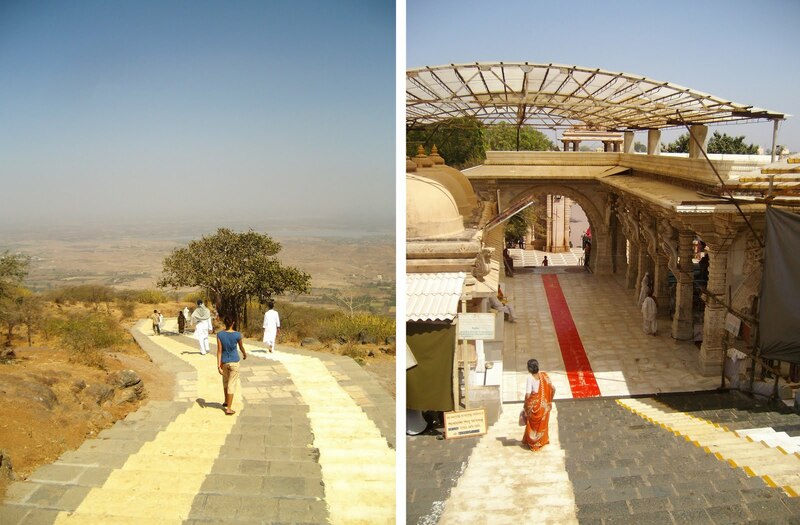 The Stair Master at the gym had nothing on these Jain temple steps. At step 2,000, we came to a lesser temple with beautiful statues, great views of the valley, and prayer flags strewn all over. 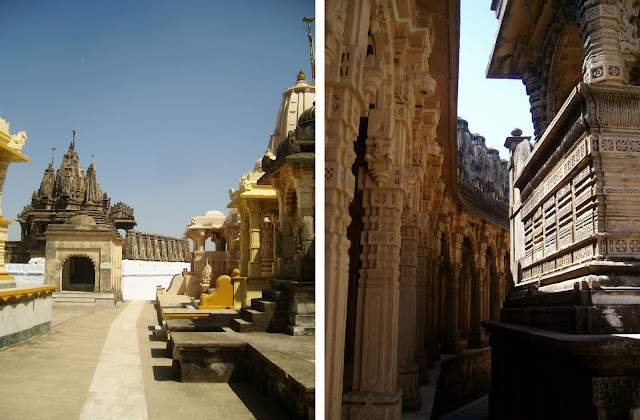 We encountered a very open and friendly family at this temple, and they were very curious about us and our reasons for visiting Palitana. We received several blessings and these interactions were what kept me going during the rest of the climb up and back. Around step 2000 on the left. Around step 3000 on the right. However, also around step 2,000, we happened to pass another backpacker on her way down, happily swigging water from her water bottle. “Excuse me” I asked her. “Are we allowed to have drinks up here, we read somewhere it was prohibited?”. I was talking more to her water bottle than to her. She replied with a peppy “No, I think it just means at the very top of the temple. Good luck for the rest of the climb, it’s so worth it in the end – it’s breathtaking up there!”. She then skipped off, fully hydrated and content. At step 2,841, I gave up. I took two more steps then sat down on the 2, 843rd step, gave a nod to the goat who winked at me as he crossed the path, and told Sergio to take a lot of pictures. The view from where I was sitting was beautiful in itself, so I spent a very content couple of minutes, waiting, catching my breath, resting my muscles and watching the pilgrims stream by me on their way up. Sergio went ahead, made it to the top, and then met me again on his way back down. We then began our descent. Upon reaching the summit, a narrow opening through some temples exposes the views of the Shatrunjaya Hills and the valley bellow. A closer look reveals some of the exquisite carving details. The way down was excruciating. My legs were like jelly, and whoever coined the phrase "it's all downhill from here" as a reassurance obviously had never walked down over 3,000 steps before. We were absolutely parched, and were constantly teased by these big basins of drinking water that lined the steps on both sides. It wasn’t filtered drinking water, and we held back from drinking, knowing the instant gratification wouldn’t be worth later distress. It was a hard decision though; intense gastrointestinal problems were beginning to seem like a viable cost for one tiny sip of the water. The last 300 steps passed by in a blur, and I focused on getting down and buying a bottle of water. I fantasized about opening the bottle, pouring the sweet cold water through my lips, letting it linger on my tongue and drinking it down. When we finally bought that first bottle (of 10), it seemed like Sergio opened it in slow motion. Water, in that moment, NEVER tasted so good. Water, something that I take for granted on a regular basis was the best thing in the whole world in those few moments. We then headed back out into the parking lot to reunite with our cab and head to the Bhavnagar airport. We fell into the cab, dirty, tired, with a bottle of mango juice in one hand, a large bottle of water in the other, and a new found appreciation for the simple things in life. Looking back, we could have stopped for breakfast first, could have inspected the rules a bit more closely, could have tried to not cram so much into a day…but then, I wouldn’t have learned to appreciate water in such a profound way. Think of the last time you were really thirsty, but then not being able to just go buy a bottle of water, or open your faucet to get a drink. Or say you slightly burn your hand cooking and can't run over to the sink to run it under an endless flow of cold water. Think of how much water we waste in a day. Think of the last time you were brushing your teeth and left the water running throughout those whole three minutes. Or when you stood in a hot shower with water pouring over your body because it felt good. Think about watering the lawn, watering the plants, how many fountains and monuments we have with gushing water. Every day in my life I take water for granted: that it exists, that there will be enough of it, and that I won’t have to work harder than turning on a faucet to get it. So taking care of a simple thing like water is another main goal for our non-profit. It would take so little to install running water in every household. Right now in Mactang, along with the lack of toilets and electricity, few huts have running water. Most people have to fill up jugs or basins at the community tap, and carry it back to their houses. 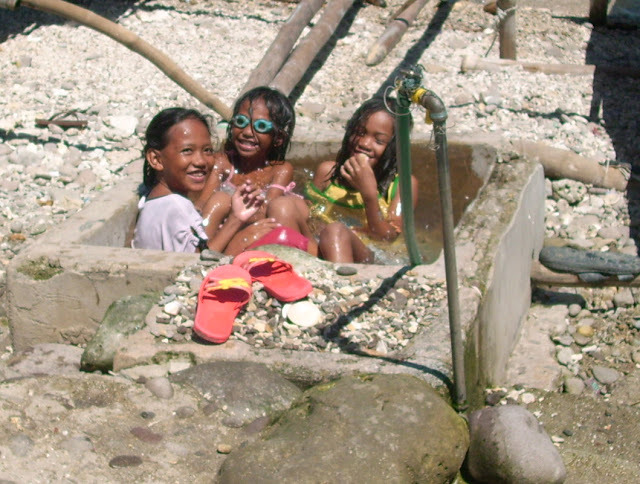 Villagers take showers out in the open at the tap, or do their laundry there. There are plenty of water sources on the island, but they haven't been harnessed and brought to each individual home yet. There is also a rainy season, which would provide ample water if we could establish a rain water collection system. These are things that we can take care of easily, and will do as one of the first projects of the non-profit. Water is and always will be a source of life, and we will bring a water system to the village of Mactang. How many gallons a day will then be pumped through Mactang, or how many liters can be collected using a rain water collection system? 100! wait, 3100! I can’t even venture a realistic guess - I’ll have to defer to Sergio to answer that technical question. How much will quality of life in Mactang be improved by the installation of a basic water system? This one I know the answer to: My life in that moment back in Palitana was improved by 1,000% when I had the first drink of sweet, readily available water after only 3 hours of "deprivation" So, I'd say that life quality for these people will be improved by an amount equal to all the candy corn, jelly beans and gumballs in the world, which is - and I’m just estimating here - a whole awful lot. Group bath at the tap!